Chimmony dam - 30 km from Thrissur City. 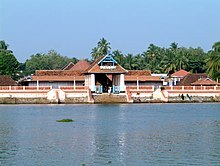 Thecke Chira, showing Ancient Veda Study Centre, in Thrissur City. Guruvayur Temple entrance - 25 km from Thrissur City. East Gate of Vadakumnathan Temple. Poothan and Thira for the Machattu Mamangam festival.